Welcome to Music Friday when we bring you hit songs with jewelry, gemstones or precious metals in the title or lyrics. 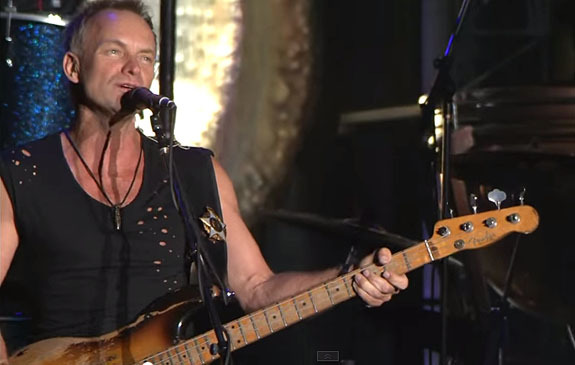 Today we have Sting of The Police singing the beautiful and timeless “Wrapped Around Your Finger” from the blockbuster 1983 album, Synchronicity. But in the end he turns the tables and the chorus changes from "I'll be wrapped around your finger" to "You'll be wrapped around my finger." The 63-year-old singer/songwriter/musician explained in Lyrics By Sting that, "this song is vaguely alchemical and probably about a friend of mine, a professional psychic and my tutor in tarot, with bits of Doctor Faustus and The Sorcerer's Apprentice thrown into the pot for good measure." "Wrapped Around Your Finger" was the fourth U.S. single released from Synchronicity, an album that topped the U.S. Billboard 200 chart and sold more than eight million copies. “Wrapped Around Your Finger” ascended to #8 of the U.S. Billboard Hot 100 chart. At the 1984 Grammy Awards, Synchronicity was nominated for five awards — including Album of the Year — and won three. Even though The Police disbanded in 1986, each member continued with successful solo careers. The group came together for a tour in 2007-2008 to mark The Police’s 30th anniversary. Written by Sting. Performed by The Police. I can see the destiny you sold turned into a shining band of gold. You will see it come to its fruition. Vanish in the air you'll never find me. When you'll find your servant is your master. First mined by the Ancient Egyptians in the days of Cleopatra, emeralds have been prized the world over for their breathtaking green color, healing properties and the promise of bringing good luck to their owners. 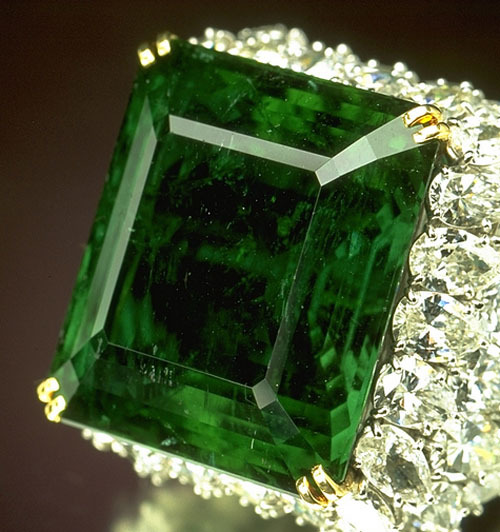 One legendary example of May’s official birthstone is the “Mogul Mughal Emerald,” a 217.80-carat precious stone that dates to the reign of Mughal Emperor Aurangzeb in 1695. Sourced in Colombia and brought to India by Spanish traders, the Mogul Mughal Emerald is 10 cm (approx. 4 inches) tall and shaped like a rectangular tablet. 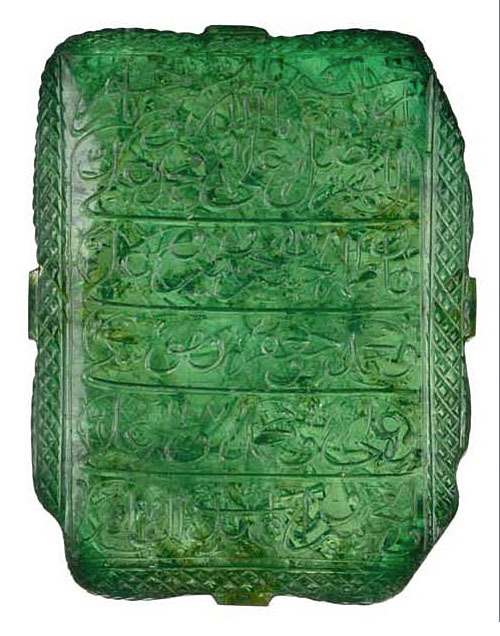 One side of the emerald is inscribed with prayer texts in elegant naskh script, a special calligraphic style for writing the Arabic alphabet. The other side is engraved with magnificent floral ornaments, including a central rosette, poppy flowers and scrolling foliate detail. The beveled edges are carved with cross-pattern incisions and herringbone decoration. The maharajas and maharanis of the Indian subcontinent coveted emeralds because their holy scriptures anointed the gem with magnificent mystical and spiritual properties. When Spanish Conquistadors discovered rich sources of large, fine-quality emeralds in Colombia during the 16th and 17th centuries, Spain soon learned that the Royals of Middle East empires and the Asian subcontinent were hungry for their precious gems. The historic Mogul Mughal Emerald hit the auction block at Christie’s London in September of 2001 and was sold to an unidentified buyer for $2.2 million. 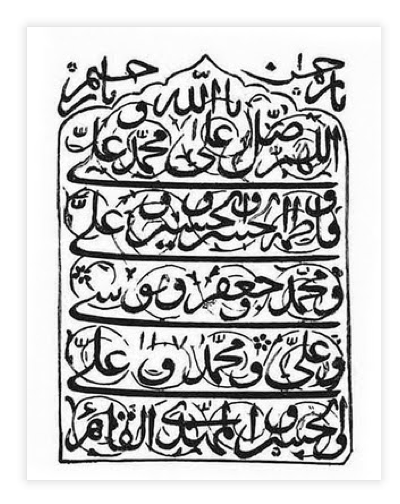 Today, it can be seen at the Museum of Islamic Art in Doha, Qatar. Emerald is the most valuable variety of the beryl family and is known to display a wide variety of visible inclusions, which are referred to as “jardin” (French for “garden"). These imperfections do not detract from the stone’s beauty but, instead, give each stone a unique fingerprint and distinct character. Colombia continues to be the world’s most prolific producer of fine emeralds, constituting more than half of the global production. 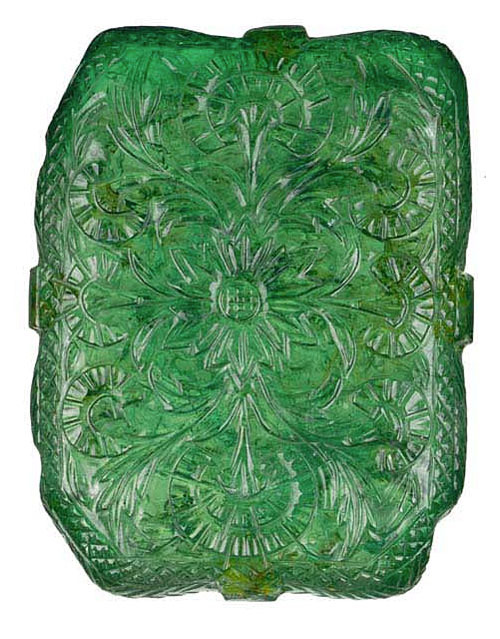 Images of Mogul Mughal Emerald: Christie’s. Colombian emerald jewelry via WikiCommons. 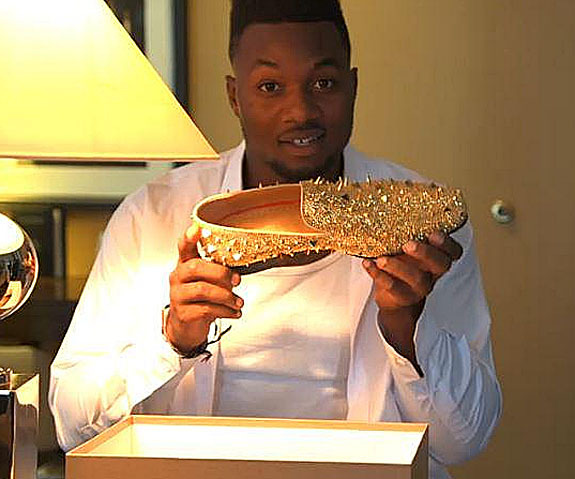 In a media spectacle reminiscent of the Oscars, the 261-pound Dante Fowler rocked the gold carpet at NFL Draft Day sporting a white suit with crimson piping, gold-and-white bow tie and $7,000 gold-studded Christian Louboutin loafers — with red soles. He was escorted by his mom, Lanora. 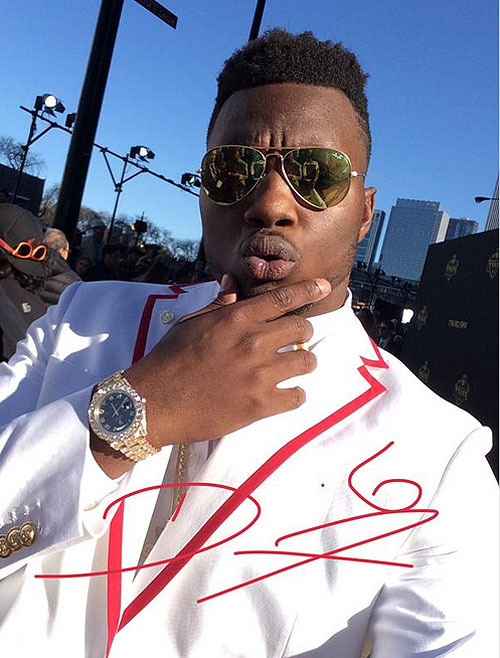 The explosive rookie defensive end from the University of Florida, who clearly has an eye for style and can run the 40-yard dash in 4.6 seconds, was drafted #3 in the first round by the Jacksonville Jaguars. In a video posted on Twitter, the 6 foot 3 inch powerhouse is shown excitedly opening a box containing his blinged-out shoes. Bright-eyed like a kid on Christmas morning, Fowler said, "You know, if your going do it big, then do it big. You know I'm here to stand out and that's what I'm going to do." 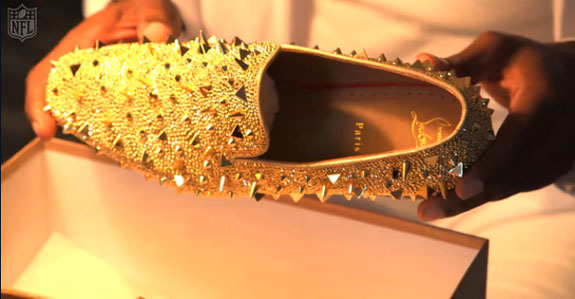 It's not every day that a fashion magazine gets breathless over a sports figure, but InStyle.com headlined its coverage this way: "These $7,000 Christian Louboutins Stole the Show at Day One of the NFL Draft." 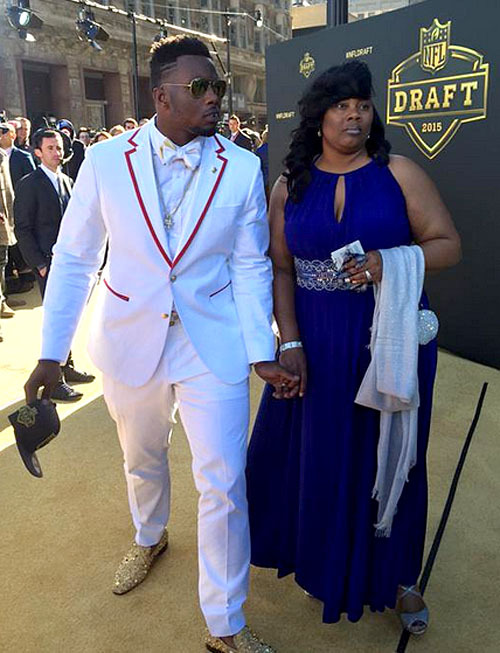 The reporter pointed out, "You couldn't see the flash of red sole until Fowler walked across the stage as a newly drafted Jacksonville Jaguar, but what a detail: it picked up the crimson piping on his white tux. It's quite a step up from cleats!" 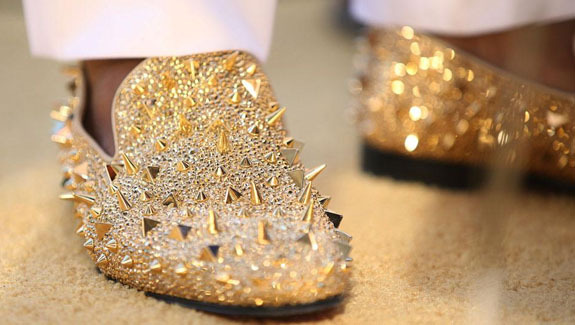 Fowler told the Associated Press that the idea to wear the gold-studded shoes to this high-profile event was inspired by fellow Florida alum Joe Haden, who wore the exact same design to his wedding in July 2013. At the time, it was reported that the cornerback, who now plays for the Cleveland Browns, had to settle for shoes one size too small because they were the only pair available in the U.S.
Fowler also had trouble sourcing the shoes, but eventually tracked them down. After he solved the shoe challenge, he had to pick a suit to match. In the Twittersphere, many observers noted that if the young man plays as well as he dresses, the Jaguars have certainly struck gold. Images: Twitter/NFL; SI.com screen captures; NFL.com screen captures. Welcome to Music Friday when we bring you memorable songs with jewelry, gemstones or precious metals in the title or lyrics. 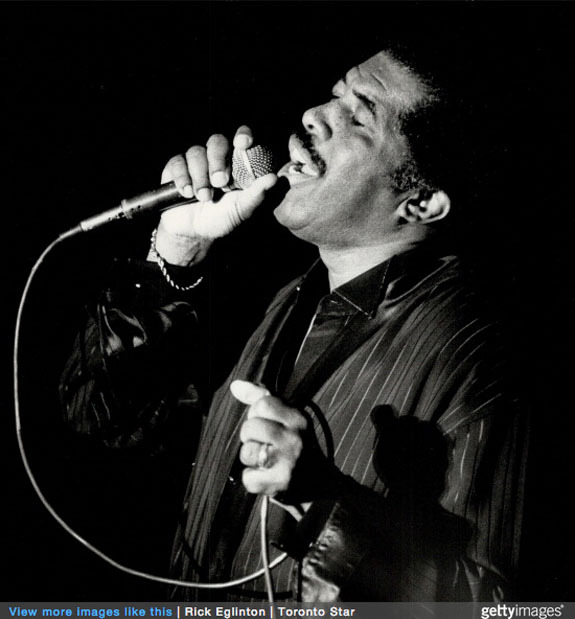 Today's featured song, "On the Horizon," is a tribute to the legendary and unforgettable Ben E. King, who passed away last week at the age of 76. King croons, "On the horizon out where the ocean greets the sky / On the horizon I saw a ship go sailing by / This was the ship that I'd often dreamed of / A ship made of gold with a golden sail above / This was the ship that I dreamed would someday bring my love." The gold ship with golden sail symbolizes something glorious for King — his ship of dreams. Later in the song, it's revealed that although the ship was a vision, his lover was not. He sings, "It kept comin' closer and closer I swear / Closer and closer 'til I woke up and found you there." King is best known as the singer and co-composer of "Stand by Me," a song that was a top-10 hit when it was released in 1961, and again 1986 when it was used as the theme of a blockbuster movie of the same name. "On the Horizon" is best known as the B-side of King's iconic hit. 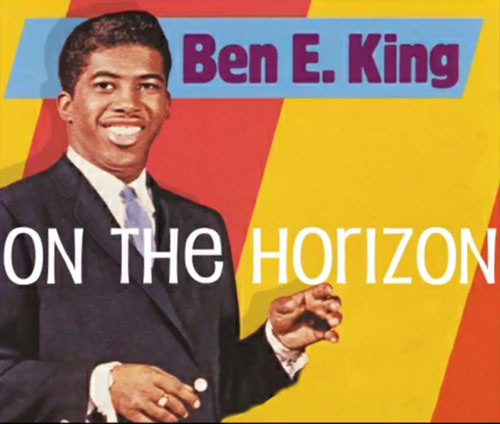 Neat trivia: The original writing credits for "Stand by Me" and "On the Horizon" went to Ben E. King and Elmo Glick, a pseudonym used by Leiber and Stoller. Born Benjamin Earl Nelson in 1938, King adopted his stage name in 1960 after leaving his role as the lead singer of the Drifters and embarking on a solo career. One year later, King was peppering the airwaves with an impressive run of songs, including "Spanish Harlem," "Stand by Me" and "There Goes My Baby." "Stand by Me" would go on to be voted as one of the Songs of the Century by the Recording Industry of America. And riding on the B-side was "On the Horizon." Written by Jerry Leiber, Mike Stoller and Ben E. King. Performed by Ben E. King. 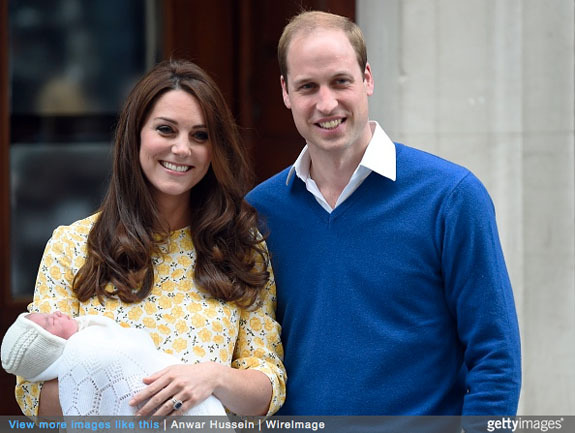 Credit: Getty Images; YouTube screen capture. 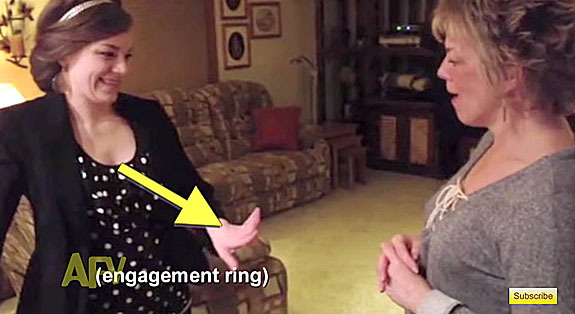 In last night’s $100,000 episode of America’s Funniest Home Videos, a recently engaged young woman tries repeatedly to get her mom to notice her new diamond ring — going so far as to put her hand right in her mom’s face — but all the mom can focus on are her daughter’s earrings and outfit. After nearly a half-minute of cluelessness, the mom finally catches on — and her over-the-top reaction is hilarious. Although it did not win the top prize, the “Oblivious Engagement” clip was a $10,000 winner from earlier in the 25th season of AFV, and competed last night with eight other clips. AFV awards three $100,000 prizes per season. 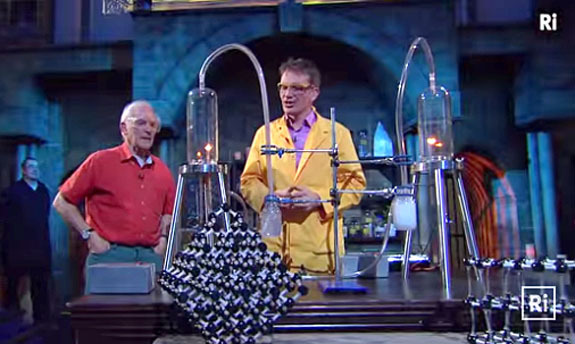 The show’s weekly viewership is approximately six million. Moms often dream about their daughters getting engaged, but the mom in the clip is so oblivious to her daughter’s clear intentions to show off her ring that all we can do as viewers is to share the young woman’s frustrations, shake our heads and let out a belly laugh. “Look at you!” the mom exclaims, as if she hasn’t seen her daughter in a while. The daughter extends her left hand to her mom and tells her she intends to paint her nails tonight. “I forgot to paint my nails,” the daughter says, hoping to draw her mom’s attention back to her hand. “Oh, that doesn’t matter,” says the mom. 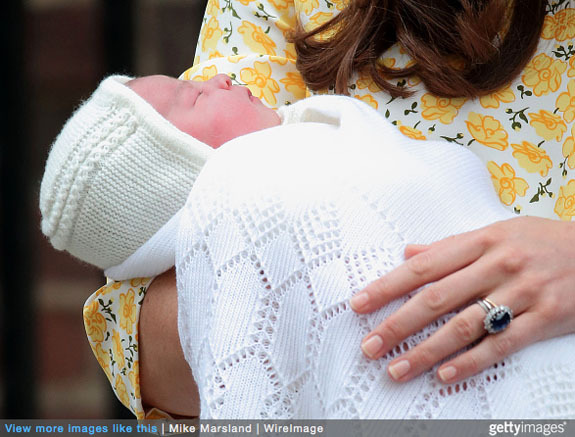 With her daughter's hand now dangling six inches from her face, the mom steps forward — to adjust her daughter’s outfit. 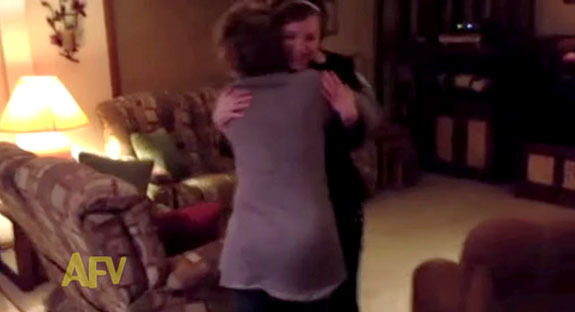 The daughter extends her left hand one more time, and now her mom freezes with surprise. Then the mom lets out the type of scream usually reserved for horror movie heroines. For the next 20 seconds, the mom goes through a series of spasms and contortions, punctuated by shrieks of joy. Finally, she gives her daughter a well-deserved hug. AFV previewed “Oblivious Engagement” on its YouTube channel a week ago and it quickly went viral, netting more than one million views and garnering coverage on sites as diverse as buzzfeed.com and goodhousekeeping.com. In its 25 seasons to date, America's Funniest Home Videos has given away more than $13 million in prize money and evaluated more than a million video clips from home viewers. Although host Tom Bergeron will not be continuing his run with the show, AFV has been renewed for its 26th season. ABC has yet to reveal who Bergeron’s replacement will be. If you didn’t see the video on last night’s show, please check it out here… If you did see it, it’s worth watching again. Enjoy! 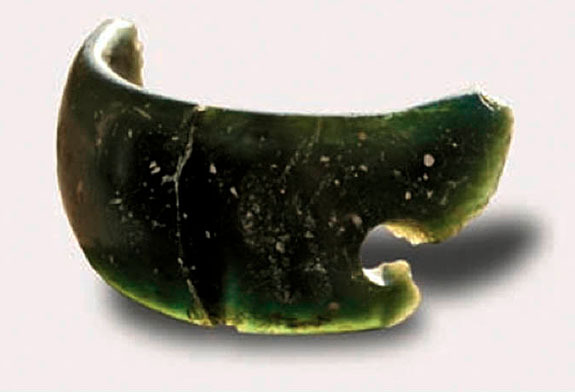 This beautifully polished calcite bracelet looks like a contemporary design, but it was actually made by our prehistoric human ancestors — the Denisovans — 40,000 years ago. That’s the claim of Anatoly Derevyanko, Director of the Institute of Archaeology and Ethnography in Novosibirsk, part of the Siberian Branch of the Russian Academy of Sciences. Besides having an eye for beauty and aesthetics, the Denisovans were skilled artisans and far more advanced than previously believed, noted Derevyanko. The 8mm round hole in the bracelet, for example, reveals that they were adept at using advanced tools, in this case a boring implement that was likely a high-rotation drill. They also showed advanced grinding and polishing skills. 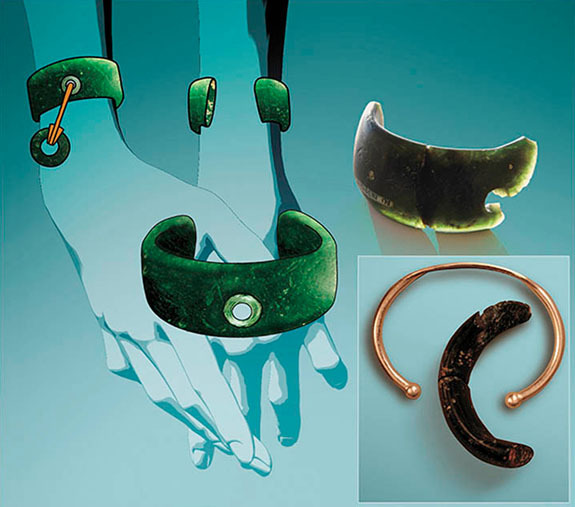 The bracelet — which is believed to be the world’s oldest piece of jewelry crafted of stone — was discovered in the Denisova Cave, a famous archaeological site located in southwestern Siberia, in the Altai Mountains near the border with China and Mongolia. Among the unique items previously discovered in the cave were remains from woolly mammoths and woolly rhinos. 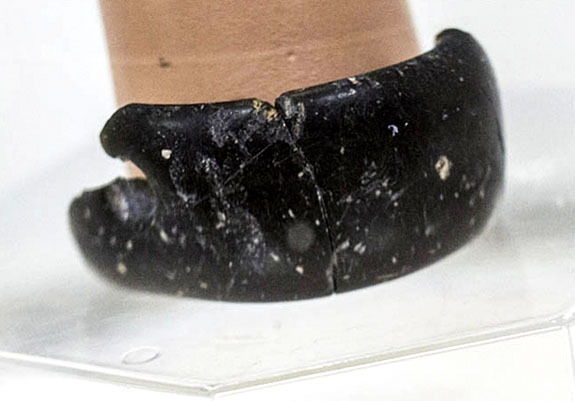 Also unearthed were the finger bone and two teeth from a juvenile female Denisovan, a now-extinct human species that was believed to be physically similar to Neanderthals. 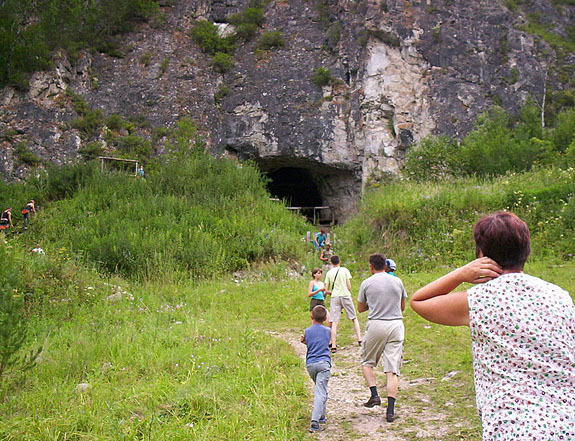 Derevyanko also noted that chlorite is not found in the vicinity of the cave. The material is believed to have come from a source at least 125 miles away, which possibly reveals how valued the “imported” material was at the time. The scientist also believes that the calcite bracelet was originally fashioned with other adornments, including some soft organic material, such as a leather strap that included a heavy charm. The calcite bracelet is on display at the Museum of History and Culture of the Peoples of Siberia and the Far East in Novosibirsk. Jewelry photos and graphics: Vera Salnitskaya, Anatoly Derevyanko, Mikhail Shunkov and Anastasia Abdulmanova via Siberian Times. Cave photo via Wikimedia Commons. With a hammer price of $30.4 million, the 25.59-carat, pigeon-blood-red “Sunrise Ruby” obliterated two auction records at Sotheby’s Magnificent Jewels and Noble Jewels sale in Geneva last night. The winning bid, which was more than $12 million above Sotheby’s high estimate of $18 million, set a new auction mark for the highest price ever paid for a ruby. 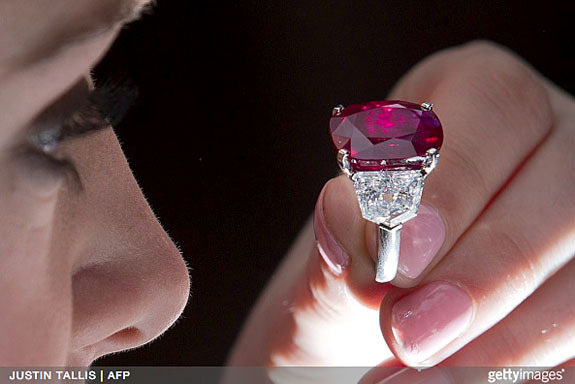 The Sunrise Ruby also established a new high water mark for the highest price-per-carat ever paid at auction for a ruby. As the evening's final lot — Lot 502 — was announced, the room was abuzz with excitement as a dark-haired model in a black dress neared the podium wearing the Sunrise Ruby on the ring finger of her right hand. Onlookers watched the drama unfold in real-time via a video feed on the Sothebys.com website. "A new record price for a ruby," proclaimed David Bennett, the chairman of Sotheby's international jewelry division, as he brought down the hammer to applause. The final price of the Sunrise Ruby eclipsed the previous record holder — the $8.6 million Graff Ruby — by an astonishing $18.3 million. The Graff Ruby was expected to retain its record for the highest price-per-carat ever paid at auction for a ruby ($997,727), but that record was crushed by the Sunrise Ruby, which ended up netting $1.19 million per carat. 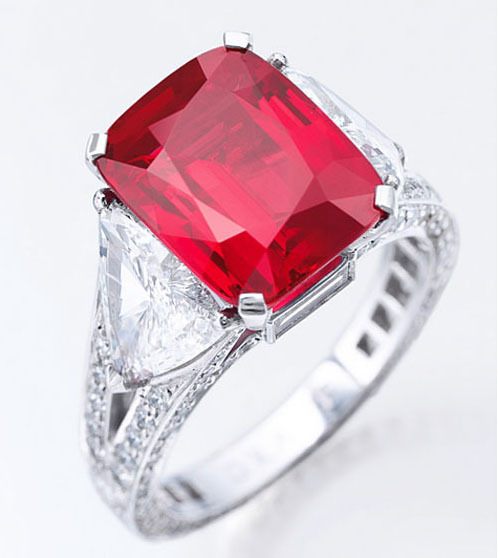 Sotheby’s had described the Sunrise Ruby as a superb and extremely rare ruby and diamond ring by Cartier. The cushion-shaped ruby is set between two shield-shaped white diamonds weighing 2.47 carats and 2.70 carats, respectively. Other high-profile lots at the Sotheby’s Geneva auction included the “The Historic Pink” diamond and the “Ivresse” diamond necklace. 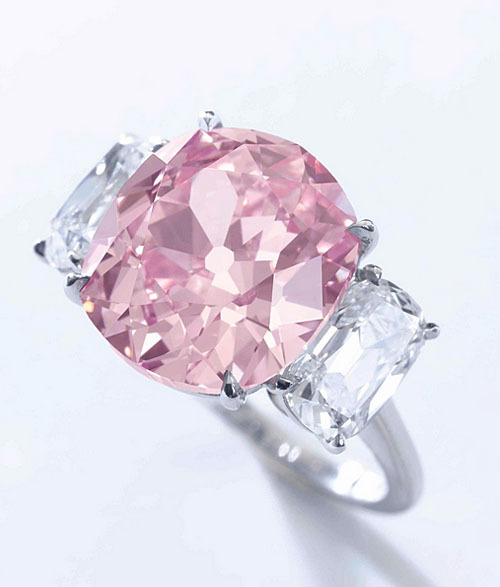 The Historic Pink, a fancy vivid pink diamond weighing 8.72 carats, fetched $15.94 million. That result was in the middle range of the pre-sale $13.65 million to $17.5 million estimate. The center diamond was once the property of heiress and philanthropist Huguette Clark and weighed 9 carats before it was re-polished. 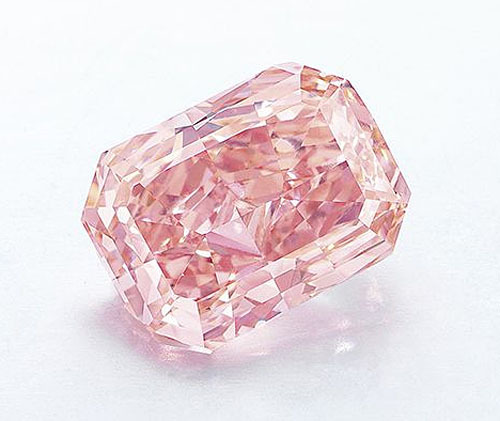 The pink diamond is also believed to have been part of the jewelry collection of Princess Mathilde Bonaparte, niece of France's Emperor Napoleon I. 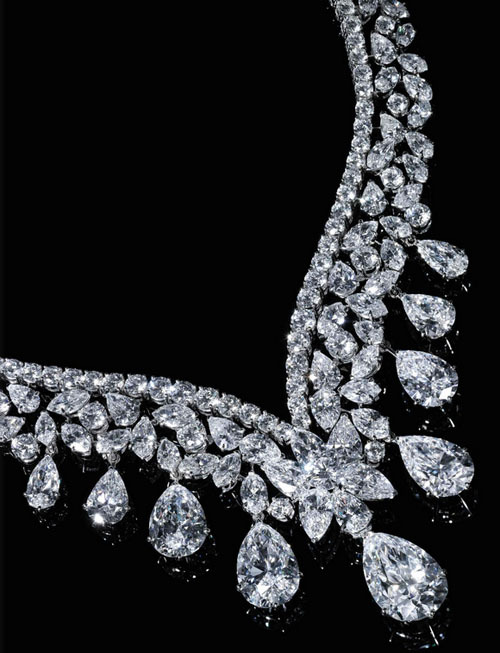 With 190.77 carats of cascading round, pear-shaped and marquise-shaped diamonds, the “Ivresse” necklace by Cartier sold for $7.27 million. This was on the low end of Sotheby’s pre-sale estimate of $6 million to $10 million. 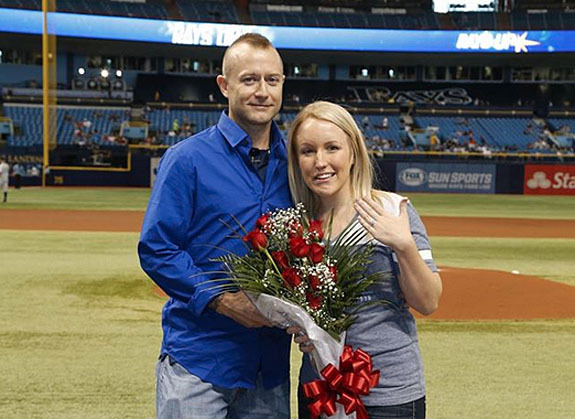 Melissa Dohme, a young nurse who, in 2012, was stabbed 32 times and left for dead by her estranged boyfriend, threw out the first pitch at a Tampa Bay Rays game on Monday night — and got a surprise on-field marriage proposal from the paramedic who saved her life. Since her miraculous recovery from the brutal attack, Dohme has been an active and vocal advocate for victims of domestic violence. 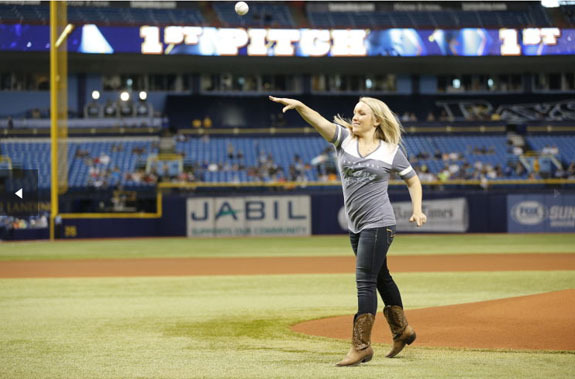 The Tampa Bay baseball team recognized Dohme’s admirable community service by giving her first-pitch honors prior to the Rays-Yankees game on Monday. As she strode out to the pitcher’s mound wearing flashy cowboy boots, the public address announcer introduced Dohme to the 10,000 fans at Tropicana Field. But, then he made a surprise announcement. 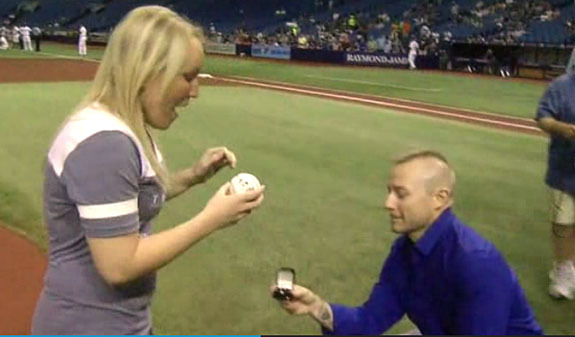 Her boyfriend, Cameron Hill, would present her with the official baseball. Then Hill went down on one knee, pulled out a small black box that contained a diamond engagement ring, and asked Dohme for her hand in marriage. The startled 23-year-old said “Yes” and the couple embraced. 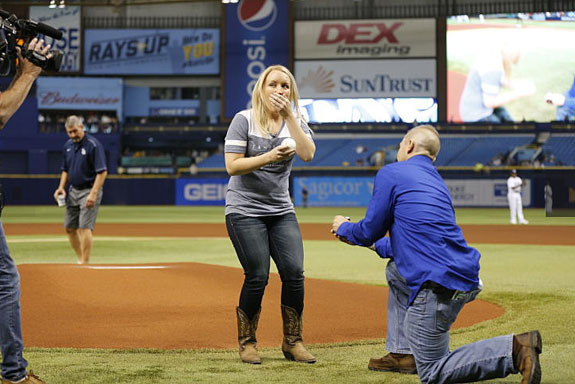 The Tampa fans cheered wildly, and then Dohme confidently threw out the first pitch, with her new fiancé handling the catching duties. The sheer joy of the moment is a far cry from the terror Dohme experienced in January of 2012. Her estranged boyfriend stabbed her 32 times and left her bleeding — and nearly dead — on the sidewalk in front of her St. Petersburg home. He had become enraged when she broke off their relationship. Paramedic Hill was a first responder that fateful day and Dohme credits him with having saved her life, according to the Tampa Tribune. As Dohme was airlifted from the scene, Hill knew he would see her again. It was a “sixth sense,” he told the Tampa Bay Times. "When I look back on that night, I can't think of it as all bad anymore because I met Cameron," she said. "He's the one I've been waiting for. My fairy tale." Dohme’s determined recovery impressed her doctors. Even though she flat-lined four times during her three-week stay in the hospital and suffered nerve damage on one side of her face, she walked from the medical facility under her own power. Hill supported Dohme’s recovery efforts and even sat next to her in the courtroom as her abuser, in October 2013, was sentenced to life in prison. The two began to date and have been a couple ever since. Dohme believes that God saved her life so she could advocate on behalf of girls and women in abusive relationships. “I’m alive for a reason and I was given this purpose to be an advocate against domestic violence,” she said. Dohme and Hill have not set a wedding date. Check out the video of how the scene played out on Monday night in Tampa Bay. Images courtesy of the Tampa Bay Rays; Facebook; TampaBay.com. Welcome to Music Friday when we bring you fun songs with jewelry, gemstones or precious metals in the title or lyrics. Today we have country music trio Lady Antebellum singing “Love’s Lookin’ Good on You” from their 2008 chart-topping self-titled album. The premise of the song is that a woman in love undergoes a beautiful and undeniable transformation. She beams with confidence, her eyes are twice as bright and she looks like a million bucks. “Love’s Lookin’ Good on You” is the sixth track on the group’s inaugural album Lady Antebellum, which released in April of 2008 and made its debut at #1 on the Billboard Top Country Albums chart. It was also a crossover success, as it reached #4 on the Billboard Top 200 albums chart. 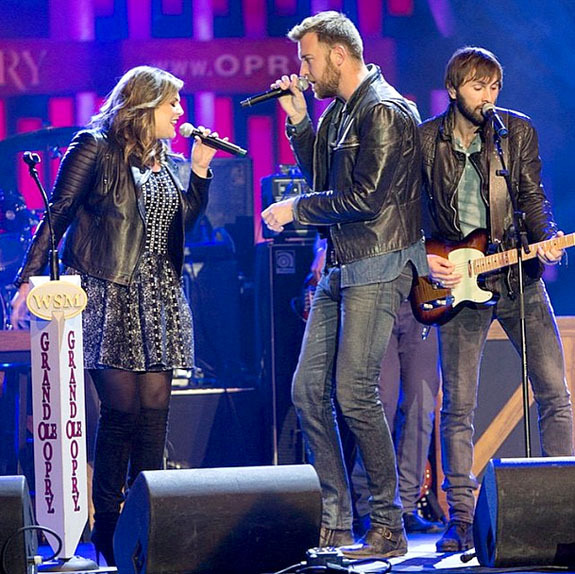 The multi-Grammy-award-winning Lady Antebellum is composed of the multitalented trio of Hillary Scott (lead and background vocals), Charles Kelley (lead and background vocals, guitar) and Dave Haywood (background vocals, guitar, piano, mandolin). The group got its start in Nashville in 2006 and signed with Capitol Records a year later. Since then, the group has released five albums and 16 singles, nine of which reached #1 on the Billboard Hot Country Songs chart. Lady Antebellum scored Grammys in 2012 for Song of the Year and Record of the Year, and another in 2013 for Best Country Album. The trio is credited with selling more than 12.5 million digital singles and 10 million albums in the U.S. Check out the awesome 2008 live performance of Lady Antebellum singing “Love’s Lookin’ Good on You.” The studio session was sponsored by radio station 96.9 "The Kat" in Charlotte, N.C. And, as always, the lyrics are below if you’d like to sing along. Written by Victoria Lynn Shaw, Jason Deere and Matt Lopez. Performed by Lady Antebellum. Why they look twice as bright. Kinda makes you think that the stars were in sync on the night we met. Throw it on out hey don't you know. That it just doesn't get much better than this. We fit just like a favorite pair of jeans. Like two kids in a candy store. And now I know what everybody means when they say. I'm telling you mighty, mighty good babe. Love is looking good on you. Displaying the velvety blue hue of a peacock’s neck feathers, a 35.09-carat Kashmir sapphire set a new record at Christie’s Geneva last week when it fetched $7.4 million — crushing the pre-sale high estimate of $4.3 million. 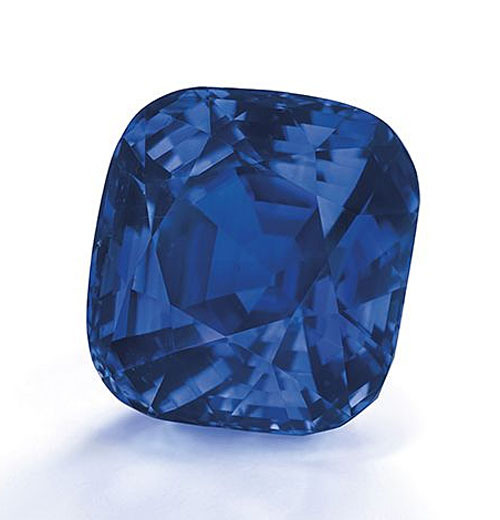 The gem’s per-carat selling price of $209,689 established a new high-water mark for a Kashmir sapphire, narrowly edging out a record set one day earlier at Sotheby’s Geneva. 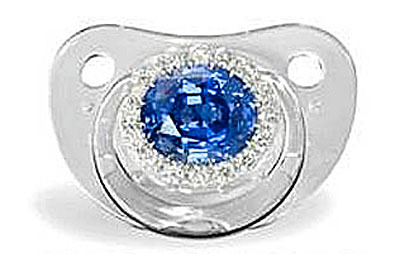 That Kashmir sapphire, a 30.23-carat stunner, had sold for $6.1 million, or $201,786 per carat. The cushion-shaped record-setting sapphire was set in a ring with triangular-cut diamond shoulders and baguette-cut diamonds accents. An anonymous Asian bidder made the purchase via phone. Other highlights from the Christie’s auction included the top lot of the night — a 5.18-carat rectangular-cut fancy vivid pink diamond that sold for $10.8 million, or $2.1 million per carat. The hammer price was on the lower end of the pre-sale estimate of $10.2 million to $13.4 million. 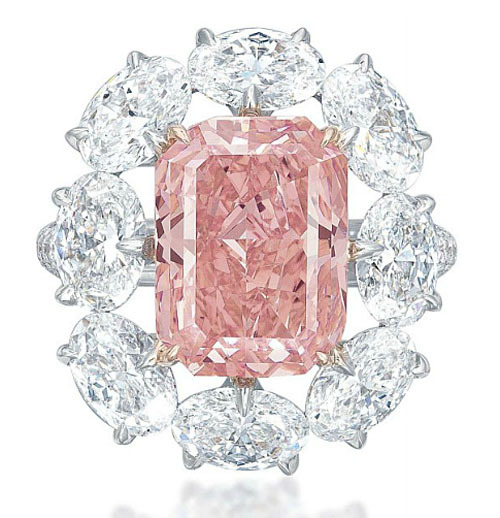 The pink stone, which was purchased by an anonymous buyer, is set in a ring with an oval-shaped surround of colorless oval-cut diamonds. 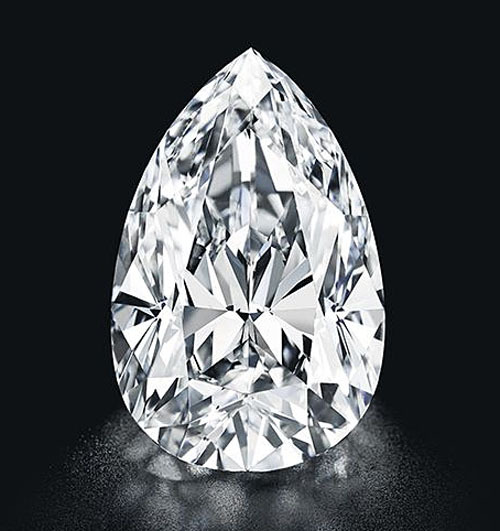 Selling for $9.03 million, or $162,711 per carat, was this stunning pear-shaped flawless Type IIa diamond weighing 55.5 carats. It was purchased by an Asian private buyer via telephone and the hammer price was within the pre-sale estimate of $8.5 million to $10 million. 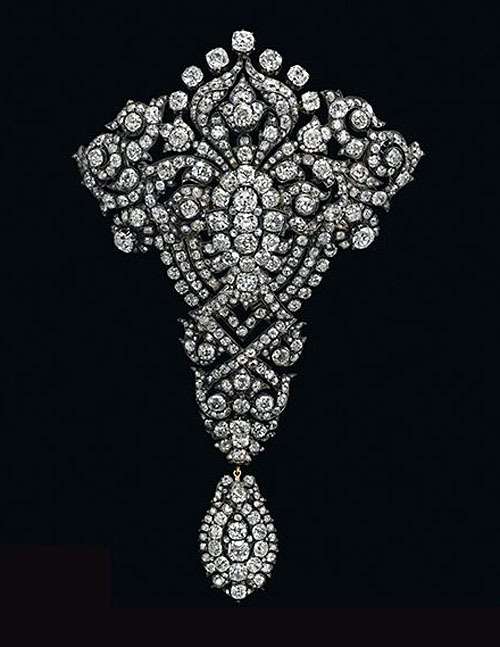 The biggest disappointment of the Christie’s Geneva sale was a 19th century diamond brooch linked to Spain's royal family. Featured on the cover of the auction house’s catalog, the final bid of 900,000 Swiss francs (about $982,000) failed to reach the secret reserve price set by the seller, thus going unsold. The brooch had been given by Spain's King Alfonso XII to the Archduchess Maria Christina of Austria for their wedding in 1879 and remained with the family until the 1980s. Sitting on its lofty perch atop the Mohs scale, diamond is the hardest naturally occurring material known to man. It is harder than a ruby, sapphire or emerald and has the ability to slice through steel like a hot knife through butter. The only substance that can scratch a diamond is another diamond. Under normal circumstances, diamonds truly are forever. But in the labs of the British Royal Institution, the famous De Beers ad slogan — not to mention the theme of the Shirley Bassey hit song — has been put to the test. Because a diamond is made of pure carbon, scientists have theorized since the 1700s that a diamond should burn like other carbon materials, such as graphite or coal. And, indeed, during the early 1770s, French chemist Antoine Lavoisier used two powerful lenses to magnify the sun’s rays directly onto a diamond. The diamond slowly disappeared and carbon dioxide gas accumulated, proving that the diamond was made from carbon. 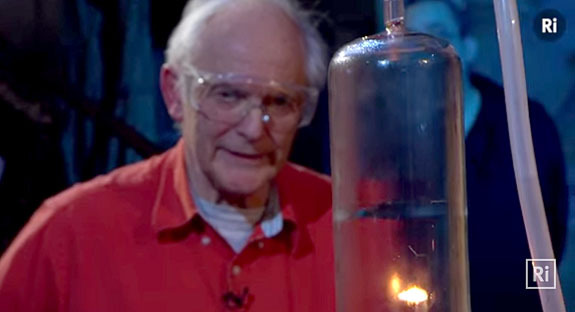 In the video below, British scientist and author Peter Wothers enlists the help of Nobel prize-winning chemist Sir Harry Kroto to demonstrate what it takes to get a diamond to burn. 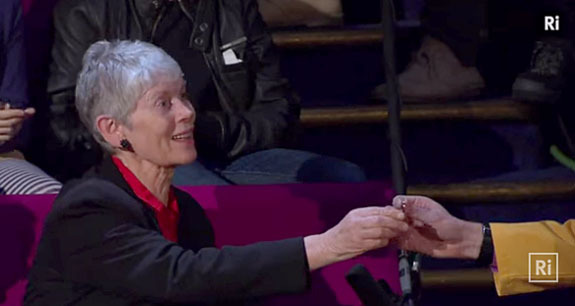 Wothers adds a bit of drama and comic relief by using Kroto’s wife’s engagement diamond for the experiment. 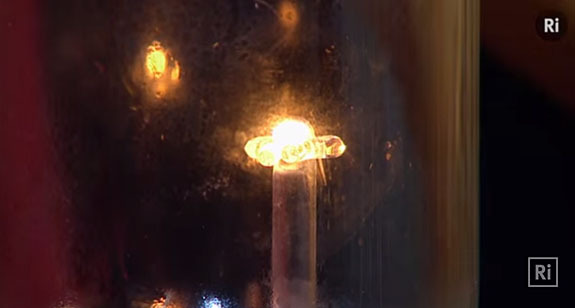 The viewer can see Kroto getting increasingly more uncomfortable as it becomes very clear that his wife’s diamond — under the right conditions — will ignite. 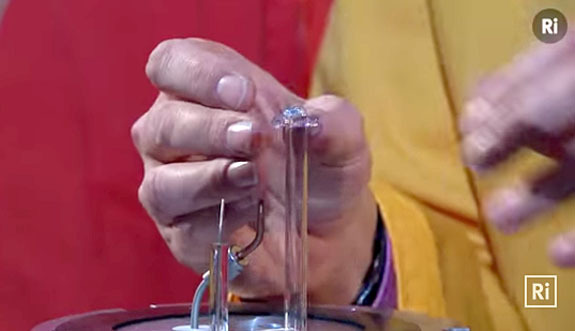 In pure oxygen, diamonds can ignite at 1320 degrees F. In normal conditions, the ignition occurs at about 1520 degrees F.
Wother’s experiment is conducted in a chamber of pure oxygen. The resulting gases are collected in a tube leading to a beaker of limewater. The experiment anticipates that if the burning material contains carbon, the smoke will contain carbon dioxide. When the carbon dioxide mixes into the limewater, it turns the mixture a milky white color — basically delivering calcium carbonate, an antacid used to calm a sour stomach. Wother’s does his first experiment using a bit of graphite, which he easily ignites using a torch. Then he ups the ante by doing the exact same experiment using the Kroto engagement diamond. Surprisingly, that lights up, too. The diamond burns as a golden ember without producing any flames. At this point, Kroto half-jokingly comments that he hopes the show can pay for a replacement diamond. As you might have figured out by now, Wother had cleverly swapped the Krotos’ engagement diamond with a much lower quality specimen before the experiment began. If you’re worried about how a diamond is protected when a ring needs to be retipped, for example, be assured that jewelers go to great lengths to make sure that the extreme heat of the torch does not affect the gemstone. Some jewelers use boron to protect the stone while others depend on the pinpoint accuracy of a laser welder to keep the diamond out of harm’s way. Kroto won his Nobel Prize in Chemistry in 1996 for his work in discovering fullerenes, a pure carbon molecule that takes a shape similar to a soccer ball. Recent research has suggested many uses for fullerenes, including medical applications, superconductors, fiber-optics systems and nanotechnology. Gerhard Wagner’s world-class collection of tourmaline — 432 lots in all with some valued at more than $500,000 — will be up for bid at Heritage Auctions in Dallas on June 7. Wagner, who is known as the “King of Tourmalines,” has been carefully cultivating his museum-quality treasures for decades. 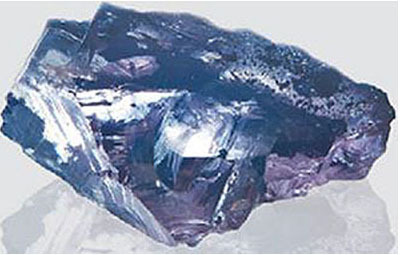 “Blue on Blue” — tourmaline on tourmaline with quartz from the Porcupine Pocket of the Pederneira Mine, Brazil, shown above (Estimate: $500,000 - $700,000). Recovered in 2001, this specimen features two major crystal types: thin and long, or stout and wide. The longest thin crystal is an enormously elongated thin blue prism 9.25 x 0.31 inches in size, and there are several shorter ones of similar proportions. 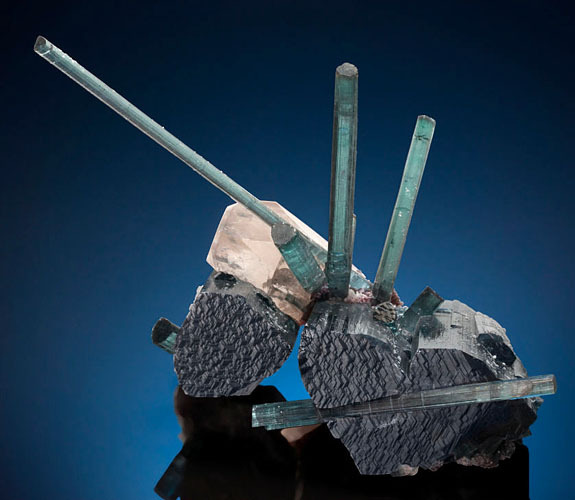 The stout tourmalines are approximately 3.93 inches across, and 4.8 inches long. The overall measurements are 5.5 x 9.1 x 6.3 inches. 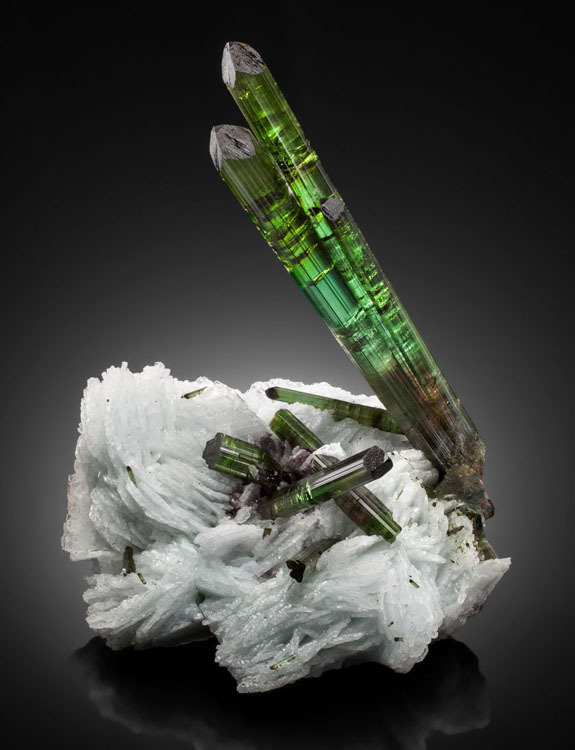 “Blastoff” — tourmaline on cleavelandite from the Grandon Pocket of the Pederneira Mine, Brazil (Estimate: $450,000 -$650,000). Rising from a pure white base of bladed cleavelandite is a stunning group of multi-colored tourmaline crystals of elongated form. The specimen is composed of roughly six crystals, but the aggregate is strongly dominated by a group displaying a radiating habit with three terminated crystals taking flight from the matrix, hence the name "Blastoff." The overall measurements are 5.6 x 5.4 x 6.6 inches. 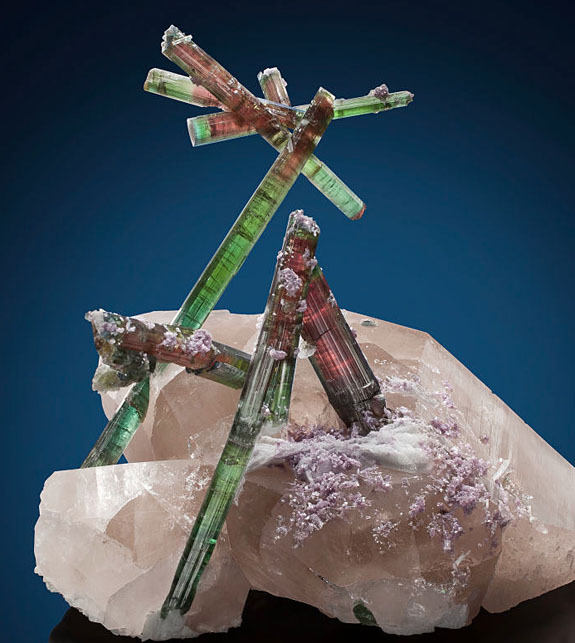 “Flower of Pederneira” — tourmaline on quartz with lepidolite and cleavelandite from the Proud Pocket of the Pederneira Mine, Brazil (Estimate: $300,000 - $500,000). This specimen is unique in a number of ways. First, it features a "flower," which is actually a cluster of four crystals attached at the termination of an already superb prism measuring 6.18 inches in length. Of the "flower" cluster, three of the four are double-terminated. A second unusual characteristic is a “bent” crystal measuring 5.31 inches long. Heritage is promoting the June 7 auction as an opportunity for non-collectors to learn about the beauty and value of the specimens as not just as minerals, but as magnificent pieces of fine art. 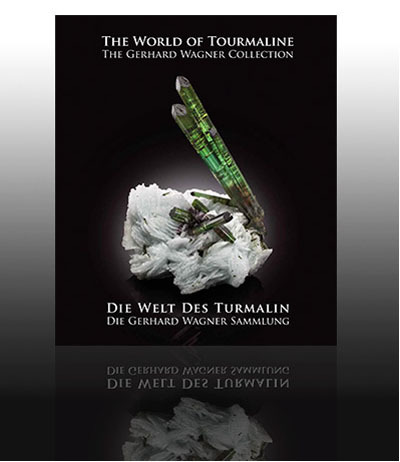 “This collection illustrates the fact that the beauty of high-quality mineral specimens make them objects comparable to the most refined forms of art,” wrote Milan-based Mineralogy Museum curator Dr. Federico Pezzotta in the coffee table book, The World of Tourmaline. The publication features 379 vivid images of Wagner’s breathtaking discoveries. According to Heritage Auctions, Wagner’s passion for collecting fine minerals dates back to his childhood, well before he could ever consider buying any of the specimens that have made him famous. The fascination that began as a child picking up fossils on the shores of Lake Constance, on the Rhine River in Germany, became a process of education, collecting and patience that have led to him being one of the most respected and well-liked names in the business, noted the auction house. A Florida geologist has discovered an unusual palm-like plant that only grows in diamond-rich soil. More specifically, the stilted, thorny Pandanus candelabrum thrives in the potassium, phosphorous and magnesium-rich soil that sits above kimberlite pipes — the volcanic superhighways that deliver precious diamonds from deep within the earth to the surface. 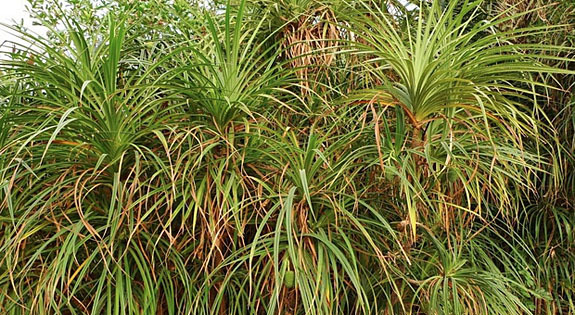 Most of the world’s commercial diamond production is derived from kimberlite pipes and the Pandanus candelabrum plant is the world's only botanical indicator for kimberlite. Where you find this rare plant, you're likely to find diamonds. 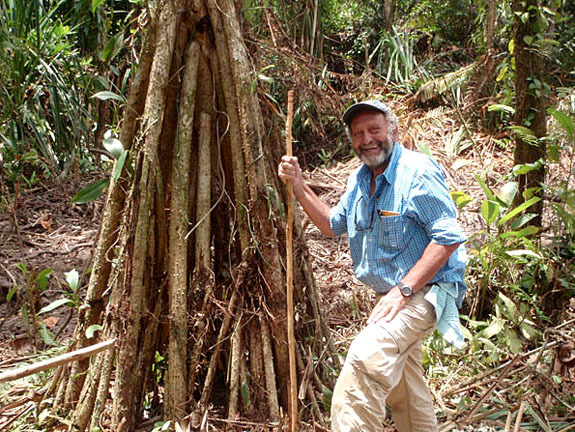 Stephen Haggerty, a professor of geophysics at Florida International University in Miami, is credited with making the connection between the palm plant and diamond prospecting. He published his findings in the June-July edition of Economic Geology. The special connection between kimberlite and the strange plant with stilt-like roots could change the way prospectors in West Africa search for diamonds. Instead of utilizing heavy gear for strip mining, they can simply pinpoint their excavation efforts to where the prickly palm is flourishing — thereby preserving the environment. Hagerty claims that, until recently, there was no reliable way to locate these small, but concentrated, deposits of diamonds hidden in the remote and dense jungle. Some diamond-rich areas are only a few acres in size. According to Science magazine, Hagerty’s clever hypothesis is already yielding real results. In a test site inhabited by the Pandanus candelabrum, Hagerty secured four diamonds, two of them around 20 carats apiece. Interestingly, the palm/diamond association has been played out with other flora and precious materials across the globe. In 2013, we wrote about Australian researchers who discovered that the roots of eucalyptus trees have the ability to draw up tiny gold particles from deep within the soil, with the gold eventually collecting in the leaves and branches. Finding precious metal in the leaves is a certain indicator of the presence of valuable gold deposits 100 feet or more below the surface. Science magazine reported that Lychnis alpina, a small pink-flowering plant in Scandinavia, and Haumaniastrum katangense, a white-flowered shrub in central Africa, are both associated with copper. And PBS.com noted that a the presence of a certain type of grass native to California is a dependable sign of nickel and chromium in the soil. Credits: Photo of Stephen Haggerty and the Pandanus candelabrum: Uncredited via fiu.edu. ; Tree by Jakob Fahr/iNaturalist (CC BY-NC) via Wikimedia Commons; Rough diamonds via Getty Images. Welcome to Music Friday when we bring you hit songs with jewelry, gemstones or precious metals in the title or lyrics. 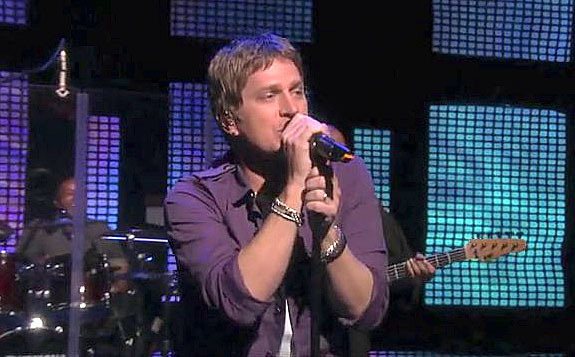 Today we feature Rob Thomas singing his 2009 hit, “Her Diamonds,” an intimate and heartfelt song about his wife’s struggles with a rare autoimmune disease. In an interview with The Canadian Press, Thomas revealed that the song was about his wife, Marisol, although his intention was to have the song transcend the personal. “Her Diamonds,” which was the lead song from Thomas’s second solo album, Cradlesong, zoomed to #1 on the U.S. Billboard Adult Pop Songs chart and topped out at #23 on the US Billboard Hot 100 chart. Fans of Thomas, who is also the frontman for Matchbox Twenty, may remember the chilling official video for “Her Diamonds.” Actress Alicia Silverstone (Clueless) stars in the video as a woman trapped in a thick coating of ice. She sits petrified and motionless on a bed, staring out the window. But, slowly, the sunlight from the window melts the ice, releasing Silverstone from her icy chrysalis. Obviously, this represents Thomas’ hope that his wife will overcome the disease and have a bright future. Thomas noted that Marisol was intimately involved with the song. She sang backup on the track and produce the arrangement. We hope you enjoy the official video of “Her Diamonds,” a YouTube sensation that has been viewed more than three million times. The lyrics are below if you’d like to sing along. Written and performed by Rob Thomas. Discovered in 1871 and considered the world’s richest diamond source for nearly a century, De Beers’ Kimberley Mine (the “Big Hole”) is up for sale. Although active mining at the Big Hole ended nine years ago, the mine in South Africa still recovers more than 700,000 carats per year by using advanced X-ray technology to sift through the tailings, or waste rock, that old-timers discarded generations ago. Only three weeks ago, we reported on a super-rare 30.80-carat Kimberley Purple, a rough diamond that was salvaged at the diamond tailings plant in Kimberley. The gem could be worth more than $1 million per carat. Originally, the Big Hole — which currently measures 700 feet deep and 1,500 feet in width — was not a hole at all. 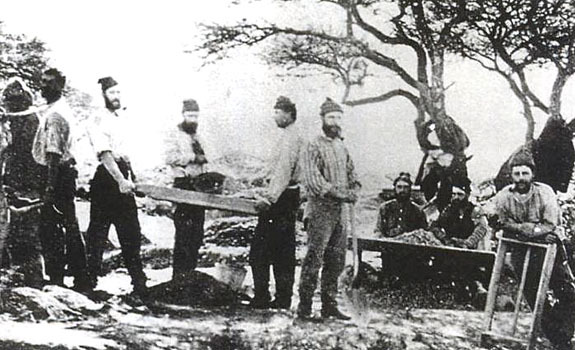 In 1871, an 83.5-carat diamond was found on the slopes of Colesberg Kopje, sparking a diamond rush in the area. 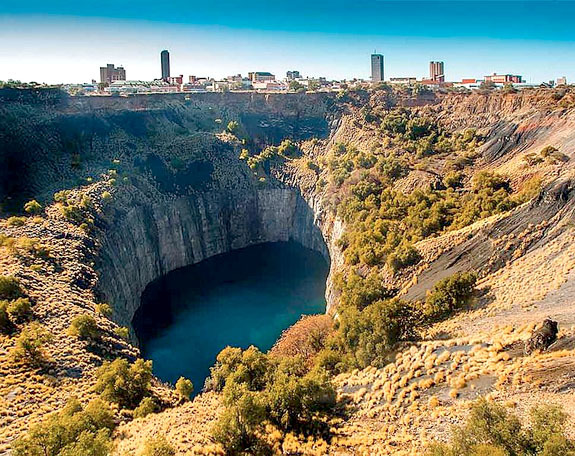 Miners flocked to the site by the tens of thousands, and the hill at Colesberg Kopje quickly turned into a giant cavity, following the subterranean path of a diamond-laden kimberlite pipe. 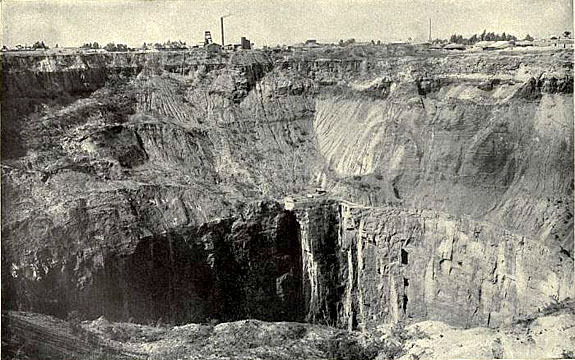 The Big Hole is believed to be the largest hand-dug excavation on earth. At peak operation in the early 1900s it employed 50,000 laborers who used nothing more sophisticated than a pick and a spade to move more than 22 million tons of earth in their quest for diamonds. The De Beers Group had planned to retire its Kimberley Mine operations in 2018, but now believes the tailings-recovery business can still be viable through 2030 — for the right operator. The company did not say how much it was seeking for the mine, but did report that the mine is generating hundreds of millions of dollars per year in revenue and more than $100 million in profit. 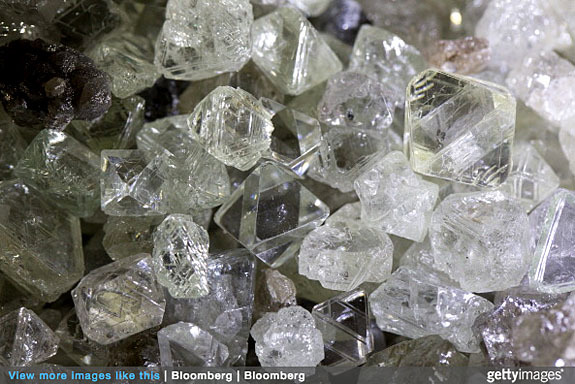 De Beers hopes to conclude a deal within the next few months. Englishman Cecil Rhodes founded De Beers in 1880. Based on the riches earned at the Kimberley, Rhodes controlled 90% of the world’s rough diamond supply by the time of his death in 1902. Images: Kimberley Mine by Hein Waschefort [CC BY-SA 3.0] via Wikimedia Commons; Kimberley Purple via nationaljeweler.com (uncredited); Kimberley Mine in 1902 by Encyclopædia Britannica via Wikimedia Commons; Prospectors on Colesberg Kopje in 1871 via Wikimedia Commons. 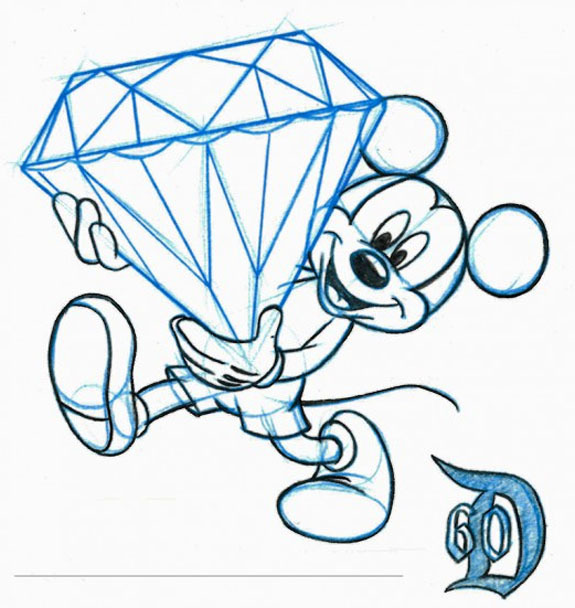 A cool artist's sketch depicting a smiling Mickey Mouse carrying an enormous faceted diamond is one of the fun souvenirs commemorating Disneyland Resort's year-long Diamond Celebration, which launched this past weekend. 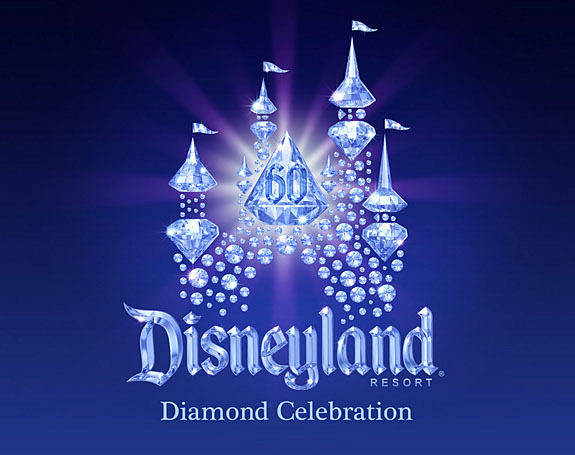 This artwork includes the D60 logo that signifies the 60th anniversary of the Happiest Place on Earth. The Mickey Mouse/Diamond sketch is the newest offering in Disney's Artist Sketch Program, which allows youngsters and those young at heart to go home with an actual hand-rendered drawing of their favorite Disney characters. The talented artists in the program are able to personalize the sketch by adding a special date, name or message, according to Michelle Harker, manager of merchandise marketing & communications for the Disneyland Resort in Anaheim, Calif. In a recent blog posting, Harker called the artwork a "diamond in the rough" because the "rough" sketch shows the basic outline of the character and the diamond but has no fill color or background. It's the type of artwork that would be used on a storyboard. The new sketches are available at two locations: Disneyana in Disneyland Park or Off the Page in Disney California Adventure Park. Sketches range in price from $39.95 for one character to $124.95 for six characters. 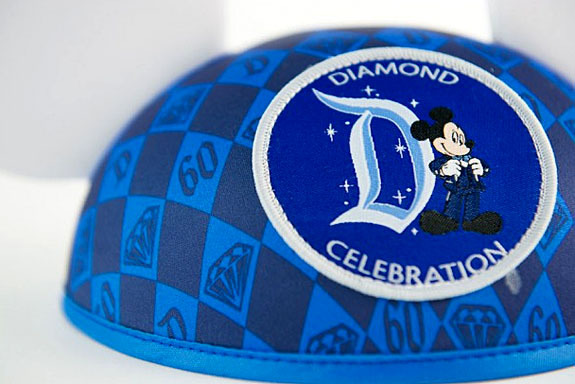 Diamonds dominate Disney's 60th anniversary branding. 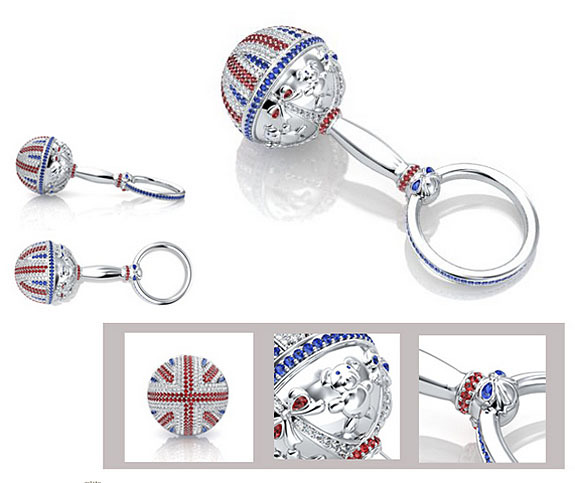 All of its celebration themes are stylized with diamond-like brilliance and faceting. 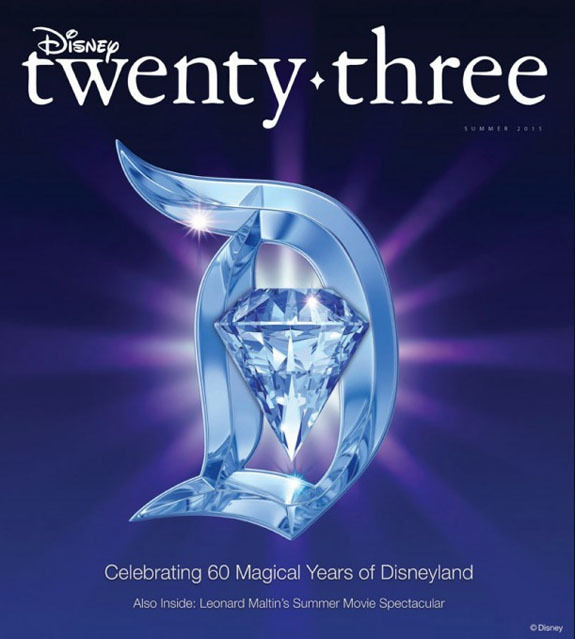 Even the cover of Disney fan club magazine twenty-three includes diamond artwork. If you were wondering, the fan club's "twenty-three" moniker honors the year 1923, when Walt Disney left Kansas City and headed for Hollywood to develop Disney Studios. Last month we reported that Disney would be giving away weekly prizes that included one- and two-carat genuine diamonds laser engraved especially for Disney. Some Disney Diamonds will commemorate dates with particular significance to the history of the park. The one-carat Disney Diamonds will be paired with a stay in the Disneyland Dream Suite. Disney officially kicked off the Diamond Celebration with a 24-hour party that started early Friday morning. Excited fans began lining up on Thursday so they could be among the first to enjoy the new attractions, which includes three new nighttime spectaculars. At Disney California Adventure, Neil Patrick Harris teams with Mickey Mouse to tell the story of Walt Disney's dream of Disneyland in a show called "World of Color - Celebrate!" "Paint the Night" parade is described as a river of color flowing down Main Street, U.S.A., with spectacular floats, Disney characters and LED lights. "Disneyland Forever" is a new fireworks show that raises the bar on nighttime pyrotechnics. 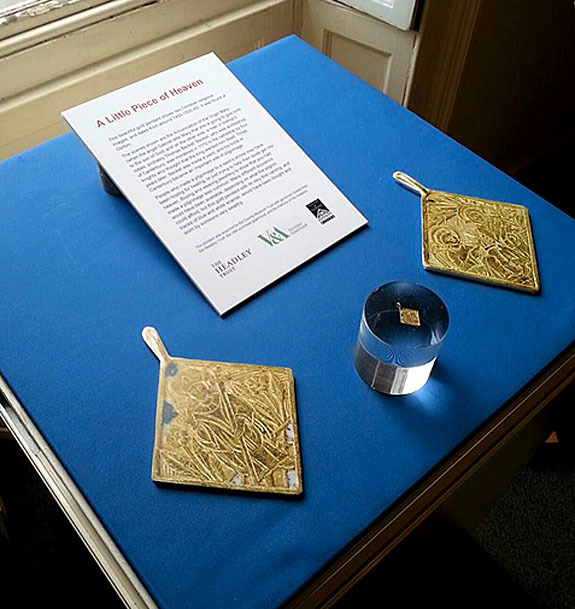 When a British woman unearthed a tiny gold pendant in her garden she had no idea of its origin or value. She saw the item as unremarkable and it remained in her possession for three decades. Recently, she tried to sell the piece as scrap gold — and this is when she learned that her humdrum find was truly extraordinary. Her local jeweler identified the masterfully engraved jewelry — depicting Christian religious images on the front and back — as a rare historical treasure dating back 500 years. The Buckinghamshire County Museum raised £13,000 (about $20,00) to purchase a "beautiful and fascinating little piece of Bucks heritage," according to spokesman Brett Thorn. 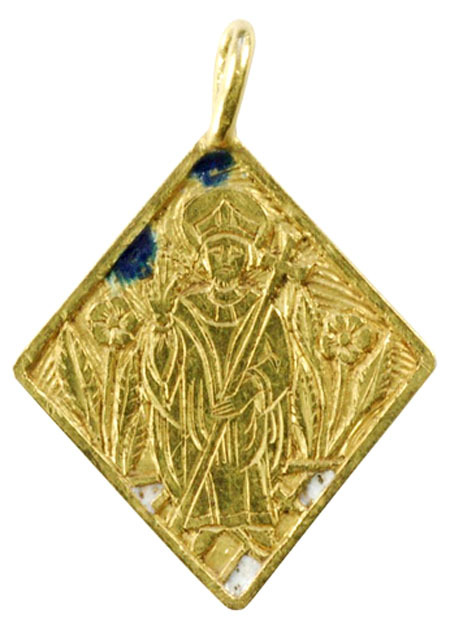 The pendant is likely a souvenir of a pilgrimage to Thomas Becket's tomb. Becket was the archbishop of Canterbury until he was murdered in his cathedral in 1170. He was made a saint three years later. Thorn said it was common for pilgrims to buy and wear jewelry to show they had made the pilgrimage. Whether the jewelry was basic or elaborate depended on what the pilgrim could afford. The museum proudly promoted its newest acquisition on its Facebook page: "1st chance to see in 500 years! 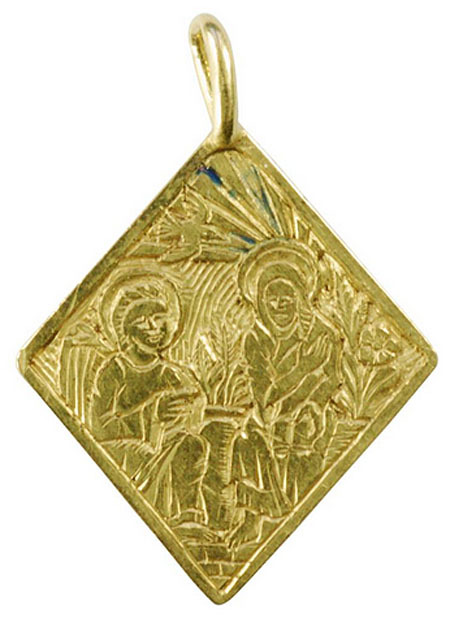 For the first time since it was lost, half a millennia ago, this beautiful gold medieval pendant, showing Christian scenes, can be admired again. A marvel of miniature craftsmanship, the detail on the scenes showing the Virgin Mary, and Thomas Becket, are stunning. Come and see for yourself, in the Jewellery Gallery, then tell us what you think..."
In an exhibit called "A Little Piece of Heaven," the piece is displayed in a lucite cylinder accompanied by giant-size replicas of the front and back of the pendant so the museum visitor can see the fine details of the work. There is some evidence that the miniature carving may have been even more colorful and elaborate when it was new because the piece shows traces of blue and white enamel. The pendant measures about one inch across, dates from 1450 to 1500 and is in amazingly pristine condition. Thorn told the BBC, "Apart from the incredible level of skill of the craftsman who made it, it also tells us something about how important religion was to the lives of the people at that time." Normally, precious artifacts dug up in the English countryside would have to be turned over to authorities under the 1996 Treasure Act. But since the pendant was found 30 years ago, predating the Act, it could be sold privately.